A new baby is a wonderful event. Celebrate the little darling with one of our memorable baby gifts. 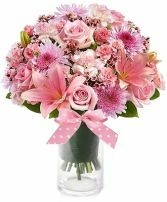 At ROCKVILLE FLORIST & GIFT BASKETS we take great pride on the baby baskets we create and the sensational baby gifts we offer. Welcome baby home with this thoughtful assortment of all of the little things that Mom and Dad will need for the baby's nursery and bath time. 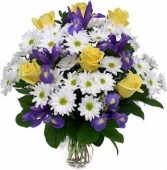 Exciting arrangement of six long stemmed yellow roses in a bed of pure white daisies and dramatic, purple irises. Wow! Welcome The Newest Addition To The Family With Our New Arrival Baby Boy Gift Basket, An Adorable Baby Basket Created Especially For The New Baby Boy This Baby Layette Gift Basket Includes A Bodysuit, Tshirt, Pants, Two Bibs, A Cap, Booties, One Baby Picture Frame, Johnson & Johnson Baby Wash, Nikkis Pantry Mints And A Cute Teddy Bear Every New Mom And And Dad Will Certainly Appreciate This Great Assortment Of Essentials For Their New Baby Boy. Welcome the newest addition to the family with our New Arrival Baby Boy Gift Basket, an adorable baby basket created especially for the new baby boy. This baby layette gift basket includes a bodysuit, t-shirt, pants, two bibs, a cap, booties, one baby picture frame, Johnson & Johnson baby wash, Nikki's Pantry Mints and a cute teddy bear. Every new mom and and dad will certainly appreciate this great assortment of essentials for their new baby boy. 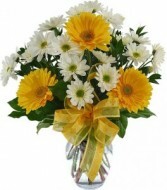 Clean, bright arrangement of white daisies and distinctive yellow Gerbera daisies, adorned with a matching yellow ribbon. 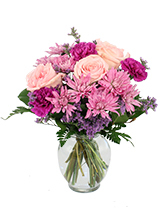 Original arrangement of dramatic vivid blooms in shades of pink and burgundy. 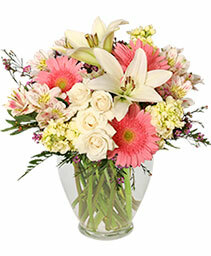 This stylish glass cube vase is arranged with stargazer lilies, lush Gerbera daisies, pink roses and just the right amount of complementary greens. An excellent choice for celebrating ,any occasion. 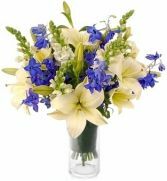 Weve Taken Our Signature Summer Arrangement As Blue As The Ocean Fresh White Roses, Deep Blue Delphinium & Lilies In Our Allwhite & Blue And Create A Beautiful, Beachinspired Bouquet That Helps You Express Yourself No Matter What The Occasion Blue Can Calm Worries And Preoccupation Representing Peace, Openness, And Serenity Fresh Floral Arrangements Filled With Blue Flowers Offer A Cooling Antidote To Anxiousness. We’ve taken our signature Summer arrangement as blue as the ocean. 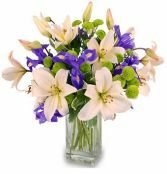 Fresh white roses, deep blue delphinium & lilies in our all-white & blue and create a beautiful, beach-inspired bouquet that helps you express yourself. no matter what the occasion. 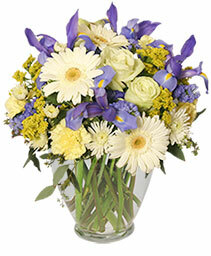 blue can calm worries and preoccupation representing peace, openness, and serenity. 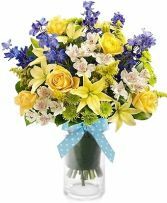 Fresh floral arrangements filled with blue flowers offer a cooling antidote to anxiousness..
A welcoming fruit gift basket for mom, dad and the new little baby boy. Along with an assortment of seasonal fresh fruit we have also included cinnamon stick cookies, Torn Ranch chocolate biscotti & toffee macadamia cookies and a soft baby stuffed bear . 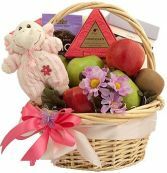 A welcoming fruit gift basket for mom, dad and the new little baby GIRL. Along with an assortment of seasonal fresh fruit we have also included cinnamon stick cookies, Torn Ranch chocolate biscotti & toffee macadamia cookies and a soft baby stuffed bear . 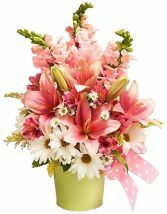 ROCKVILLE FLORIST & GARDEN in Rockville, MD (MD) has great gift ideas on hand for any new mommy or baby. 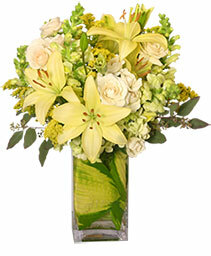 Help welcome an addition to the family with a beautiful floral arrangement or gifts. 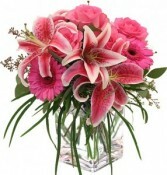 Beautiful flower centerpieces add to the decor of any baby shower, and every new mom needs a corsage for the event. Hoping for a unique shower gift? 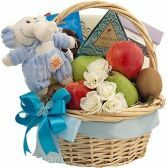 Customized new baby gift baskets are always a perfect way to let someone know that you care. 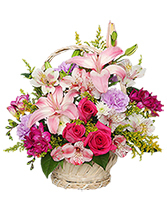 ROCKVILLE FLORIST & GARDEN will fill your new baby gift basket with gourmet snacks, bath products, fun jewelry and accessories, flowers, or stuffed animals that are sure to excite any new mommy. 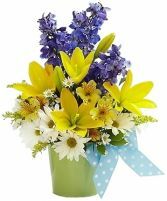 Top off your fun, unique new baby gift from ROCKVILLE FLORIST & GARDEN with a balloon bouquet. Browse and purchase online from our selection of baby floral arrangements designed with a baby girl or baby boy in mind. Stop by our store or give us a call to place an order for something truly unique. Let ROCKVILLE FLORIST & GARDEN in Rockville, MD (MD) take care of all your new baby gifts.